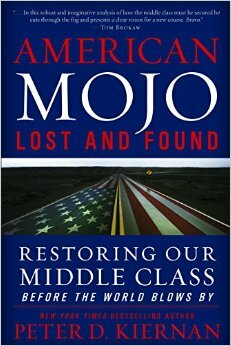 In American Mojo: Lost and Found, Peter D. Kiernan, New York Times bestselling and award-winning author, focuses on America’s greatest challenge―and opportunity―restoring the middle class to its full promise and potential. Our educated, skilled, and motivated middle class was the cornerstone of America’s postwar economic might, but the country’s dynamic core has struggled and changed dramatically through the last three decades. Kiernan’s extensively researched story, told through individual histories, shows how the middle class flourished under unique circumstances following World War II and details how our middle class has been rocked and shaped by events abroad as much as at home. By excluding too many Americans, the middle class we reverently recall was fractured from the beginning. What emerges through his storytelling is a picture of middle-class decline and opportunity that is fuller, more moving and profound, and ultimately more useful in terms of charting a path forward than other examinations. His unique global perspective is a vital ingredient in charting the way ahead. This new frontier thesis shows that middle-class greatness is again within our grasp―if we take some powerful medicine and seize the global opportunity. America possesses the skills and talent the world needs. Americans must embrace what brought our middle class to prominence in the first place―our American Mojo―before it is too late and other countries steal the march. All that is at stake is the soul of our nation. This entry was posted in Books and tagged lost and found, middle class, peter kiernan. Bookmark the permalink. Mr. Eley – HBCU Money’s contact information is hbcumoney@yahoo.com – Look forward to hearing from you.